Hi guys! I can't believe it's Wednesday already! Don't forget that the giveaway for the Frenzy Polish custom color called Emerald of Chivor ends this Friday so enter today. There's be a great response to the segment, and I have even more surprises in store. Check back on Friday for another Nibs & Nails + giveaway. Tonight I have a duo that was released as a pre-order for only 24 hours back at the end of July. Unfortunately you can't get these anymore, but I figured I'd show them to you guys anyway. Nvr Enuff Polish was the guest maker and I've been wanting to try them for ages. The duo was called Beauty on the Beach and featured a glitter and a holo flake polish. Without further ado, let's get to the swatches and reviews! Hi guys! I hope you had a great weekend because I know I sure did! I saw AC/DC in concert (with Axl Rose as the lead singer!!) and it was awesome. Like I mentioned last week, I went with my brother who is a huge Guns N' Roses fan. Tonight I have a color from the brand Polished For Days called Numinous. Let me tell you a little secret about myself: my vocabulary isn't the greatest. My husband has an expansive vocabulary (he has a few degrees in the humanities), and it makes me feel like I should go through a few verbal sections of the GRE again. I had no idea what the word "numinous" meant and had to look it up after the polish arrived (apparently it means "having a strong religious or spiritual quality"). But get this, my husband didn't even know! Hooray, it wasn't just me not knowing! The more you know. Anyway, Numinous the polish has silver and gold holographic microglitter and loads of ultrachrome flakies. How gorgeous is this? I don't normally gravitate towards gold polishes, but this one just called out to me in the store. I was worried the polish would be too sheer, but I found that it fully covered in just 2 coats. The formula was a little thick in a good way. Numinous is a little on the expensive side since it retails for $11, but they have sales sporadically. You can find more information about Polished For Days on their website, Instagram, Twitter, and Facebook pages, respectively. Hi guys! How has your hump day been? My brother is visiting this weekend and we are going to see AC/DC in concert. Woot! Needless to say, I am super excited! 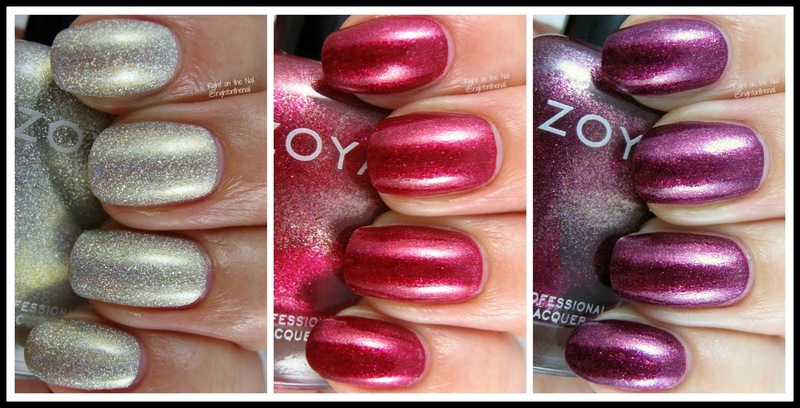 Also, welcome back to the second half of the Zoya Metallic Holos set from the Urban Grunge collection. Tonight's polishes are even more exciting if I do say so myself. Shall we go ahead and get started? Hi guys! I hope the start of your week is off to a great start! I was completely swamped at work today, but that's not always a bad thing. Oh, and there will be another Nibs & Nails this week, so keep your eyes peeled for that. 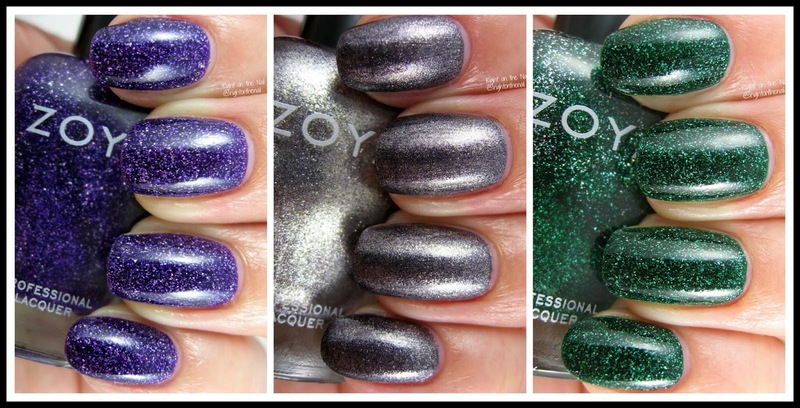 Tonight I'll be starting the shimmery side of the Zoya Urban Grunge collection. This side of the collection features 3 holo finishes and 3 glass-flecked metallic finishes. Without further ado, let's do this! Hi guys! TGIF! No Nibs & Nails tonight, but you still have about an hour before the giveaway for the Anonymous Lacquer polish from last week ends. Good luck! I've shown several polishes from the brand LeChat in the past, and tonight I have 2 of the colors from the Iced Collection. This set features 3 glitter topcoats, 2 cremes, and 1 metallic polish. They are available as gel or regular nail polishes, and each nail polish collection usually comes as a set of 6 in mini bottles. You can get these mini polish collections at your local nail supply store or at online e-tailers such as Transdesign (all 6 will only set you back $4.95). Without further ado, let's do this. Hi guys! I can't believe it's Wednesday already. Tonight I have 2 polishes from the Barielle Couture Me collection which features 6 cremes. Shall we investigate further? Up first is Berry Posh which is a berry pink creme. It's a very OPI-like polish, right? It's not the most unique color in the world, but it's a really fall-appropriate color. It had a great formula and application in just 2 coats. Now this is more interesting! Boho Chic is a deepened forest green creme with some blue undertones (so perhaps it's more of a teal?). It's a great color for fall or even winter if you ask me. 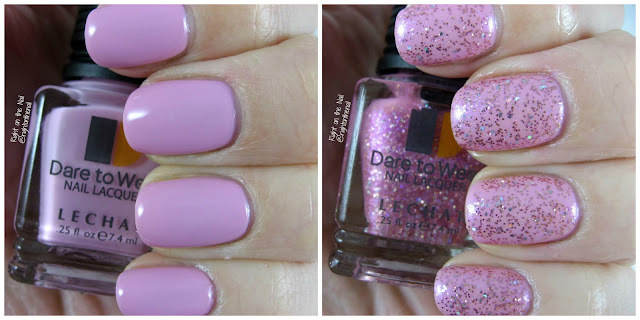 This has a bit of "ugly bottle syndrome" but it had no impact on the color on the nail at all. Perhaps if I shook it a bit more the bottle would have looked a little better. I didn't do this because the shaking would add air bubbles to the polish, and I was looking to avoid that. Pictures show just 2 simple coats. I should note that I had no problem with staining with this polish, but it's the type of color that is notorious for it, so double up on basecoat. Currently Berry Posh is available with the ProSina finish, and I couldn't find Boho Chic on their website at all. Sorry for posting a polish that isn't currently available! As I mentioned yesterday, the regular polishes retail for $8 ($9 for the ProSina colors) on their website, but check the sales or free shipping offers on their Facebook page, Twitter, or Instagram pages. Hi guys! The name of the polish I have for you tonight has me all nostalgic for The Little Mermaid. Who doesn't love the song "Under the Sea" from Sebastian the crab? My parents still have these 2 stuffed Christmas ornaments of Sebastian and Flounder at home. I haven't seen the movie in years, but I definitely need to check it out. Actually, I don't think it's on Netflix or Amazon Prime streaming services, so I'll have to find another way to get my fix. Under the Sea comes from the spring 2015 Barielle Gentle Breeze collection and is a medium teal shade with strong green undertones and subtle silver shimmer. I love a good teal, especially during the summer. The formula was a bit thin, but it built up to full opacity in just 2 coats. I really enjoy Barielle polishes, and they are definitely an underrated brand. The regular polishes retail for $8 ($9 for the ProSina colors) on their website, but check the sales or free shipping offers on their Facebook page, Twitter, or Instagram pages. Hi guys! Welcome back to another week of Nibs & Nails, a feature where I ask indie makers to dupe (or just to be inspired by) popular fountain pen inks with shimmer or sheen. 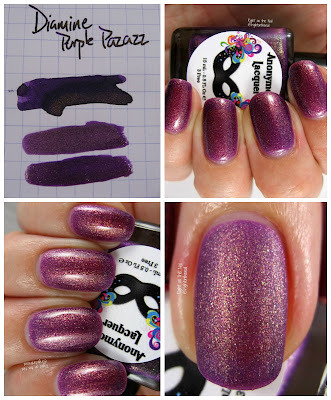 This week the spotlight is on Anonymous Lacquer. Mildred is the mastermind behind the brand, and she was actually the first maker to make a polish for this blog segment. Anonymous Lacquer is famous for their beautiful shimmer and holo finishes. I've been meaning to purchase for a long time, so I was excited to purchase a custom from her. Stay tuned to the end of the post for more information on this week's giveaway. 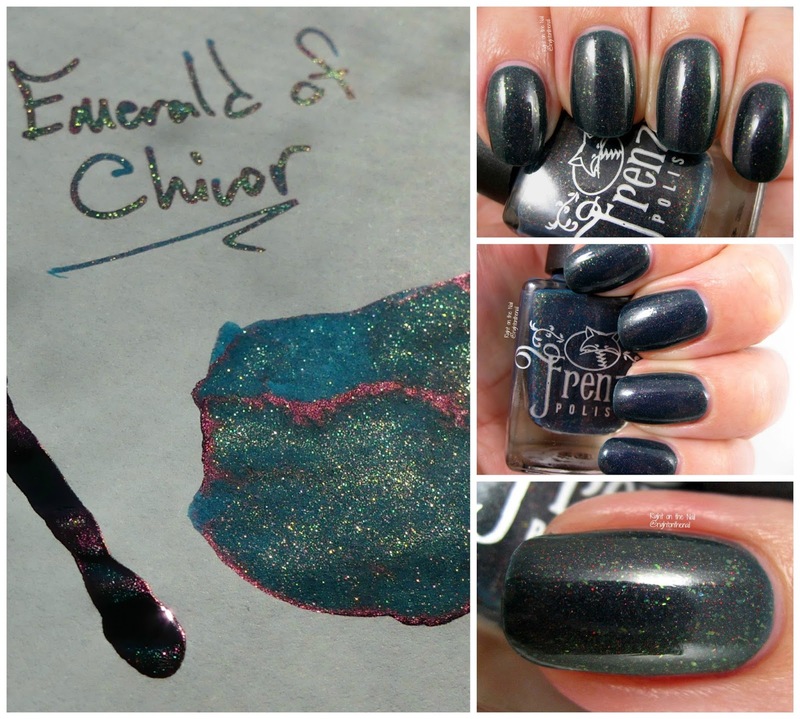 As always, check out my husband's blog (Inkdependence) before looking at the swatches to get a sense of the ink this week's polish is based off of. On first glance, As Good as Purple Pazzazz is quite different than the ink, but I don't blame Mildred at all. Like I said above, this was the first custom I asked anyone to do, so not every aspect of the blog segment was thought through. All she had to go on was pictures from other blogs, and the picture she sent me of the polish she made looked really close to the ink. About a week after she finished the polish I had the great idea of having the makers get a sample of the ink so they could properly dupe the inks. All this being said, I still love how the polish turned out. I know I'm not the only purple fan, so I think lots of you will want to win this for your own collection. The ink is a bit more of a violet purple with gold shimmer, while the polish has more pink in it. You'll need 2 or 3 coats of the polish depending on your nail length. I used 3 coats for the photos above, but I wanted to make the color as dark as possible. I think the mattified version is gorgeous, but the topcoat makes the polish lighter (and less like the ink). Make sure to stop by the Anonymous Lacquer store where Mildred will make a custom polish of your dreams for just $12. Giveaway time! Hi guys! It's been a crazy week (it's actually the last week at my job - I'll talk more about that soon), so this is going to be relatively short. Nibs & Nails will be back tomorrow with another giveaway, so make sure to check back then. I got Tali from the Julep Jan. 2016 It Girl Maven Box and it is a frosty blue linear holographic polish. The holo finish isn't in-your-face, and will not show the rainbow effect in indoor light. It's a pretty polish nontheless. It only needed 2 coats for full coverage, but dried a bit dull without a good topcoat. Also, make sure to wait an extra minute between coats because this one tends to bald if you don't wait long enough. You can get Julep polishes in their monthly Maven box, on their website, or your local Sephora store. Hi guys, I'm back! I had a great trip to Virginia Beach and Washington DC (where I worked at the 2016 pen show). Also, I just received the fall collection from Zoya, so be on the lookout for those in the next week or 2. Lillian Eve is a new brand to the blog, but they're one I've heard about for a few years. When they contacted me to review a polish, of course I jumped at the chance. The brand is named after the owner's daughters, Lillian and Evelyn (aww! ), and the polishes are vegan, cruelty-free, and 5-free. I didn't know this, but they also have a monthly subscription box called Color Monthly and costs $10 for 1 full-size nail polish, a bonus product sample, and exclusive special offers. You can find more info here. Tonight I have Cabana Girl which comes from the In the Moment Collection and is a turquoise cream that leans heavily towards green. I've been wearing a ton of indies with a variety of finishes, so it was a little weird going back to a creme. I've never used the brand before so I didn't know what to expect in terms of the formula, but I'm happy to report that it was perfect! Perfect! I could have easily used 1 coat for full opacity, but I used 2 out of habit (and because photos are unforgiving). I wish Essie's cremes could be this easy to apply. This is a great green to wear as a pedicure during the summer, right? It appears that most Lillian Eve polishes have creme or shimmer finishes (no glitters or flakes right now) and all will set you back $12. This is at the higher end for indies, especially for cremes, but I think that the formula may make it worth it for you. You can find out more about Lillian Eve on their website, Facebook, Twitter, or Instagram pages.